Feline Yogi’s cat yoga mats are a designated spot for cats to stretch and play. They can dig their nails in and knead their little hearts out, without disrupting your flow—or your mat. Maker Paige Guthrie Hodges noticed how her cat was drawn to her yoga mat’s texture, constantly getting in the way while she was trying to exercise. She figured if cats had their own mat to play on, they might leave their humans alone. Paige cuts typical yoga mats down to a more cat-friendly size. She attaches a catnip-filled twine ball to the mat with sisal rope, increasing the incentive to curl up on that mat instead of yours. This all-in-one lounger, scratcher, and toy wipes clean and travels easily. Bring it along as a distraction at the vet or when your cat is in an unfamiliar place. 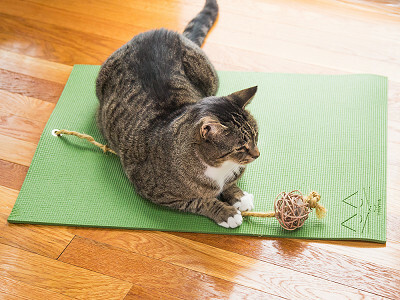 Hopefully your cat won’t interfere with your downward dog if he—or she—has their very own yoga mat. Hello everyone! I'm proud to introduce Feline Yogi to The Grommet. I'd be happy to answer any questions you have! This is a combination of so many products: cat toy, catnip, scratching mat, how did you get the idea to create something like this then include all of the elements? Actually developing a business, was that an ‘aha’ moment or was it something that took a little time? My husband had been telling me for years that I should create a yoga mat for cats since they all congregated on my mat every time I used it. It was hysterical to him to watch me working around the cats and modifying the poses to accommodate them. Although the idea has been planted in my brain for several years, one day I just decided that I need to do this! And thus began the design phase. The first thing I did was design my logo and it took me about 10 minutes to sketch it out. I have been drawing cat faces since I was a kid. I always knew all that doodling I did in algebra class when I should have been paying attention to the teacher would come in handy some day! And it did! 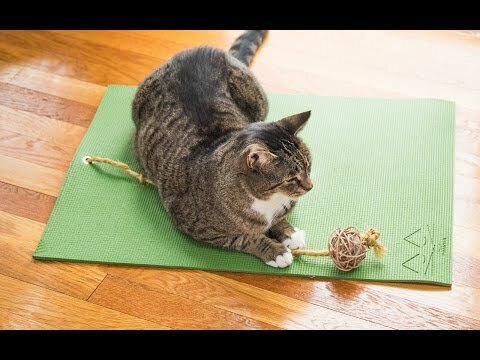 Why is this a must have for cat owners who do or don’t practice yoga? Because cats love surfaces like yoga mats to lounge on and they look so cute while on it! It's a very functional item and also a great place to serve loose catnip so your floor is saved. It can go with them to the vet and it's easy to clean. Serious question: does your cat refuse to do the downward dog pose on Feline Yogi? Yes, Pippy, the CEO (Cat Executive Officer) of Feline Yogi does not believe such a pose exists and that the correct name is "downward facing cat." She and several of her other conspiracy oriented kitty friends believe the doggie lobby invested millions in having the name of this important pose changed. Pippy and my other cats are experts at practicing resting pose on the mat and scratch asana! Hi Page, Is the catnip infused in the fibers of the mat and is there a strong odor? Can we refresh it? 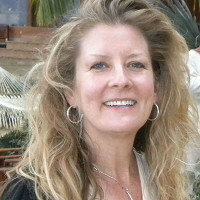 @Brenda Great question! The catnip is actually stuffed inside the rattan ball toy on the mat. It's a small potent catnip sachet that is placed inside. If one wants, the mat can be ordered without the catnip inside the ball. There is no strong odor and yes, you could refresh the ball by stuffing another catnip sachet inside if you wanted to. Does this answer your question? Please let me know if I can answer anything further and thanks for your interest. OMG I am in LOVE! One of my little boys can not wait to get on top of my mat and scratch. This is perfect for him! When I'm stretching my other boy sits on my head so maybe them having their own mats will save mine. Thank you!! @Brandi Thanks so much for your kind words! I know! Cats just love yoga mats don't they? Now that my cats have their own yoga mat I can definitely say my yoga mat is in much better shape! LOL Meow and Namaste! Do you find that cats will chew on the mat, and if they do, will little pieces come off of it? @Christine Most cats just like to lounge and scratch on the mat. Based on our testing and the feedback that we have received, chewing has not been a problem. The mat is very durable and would be hard for them to bite a piece off with their teeth. That said, I do know that some cats love to chew, just depends on the cat. As a safety precaution, I always encourage people to monitor any pets during play time and remove any loose or broken parts that may present a hazard and to adequately supervise your pet with any of our products or any other toy/mat for that matter. Thanks so much for your question. Your a genius! My cats (13) would love this. They love my mat and look for it when I put it up under the couch. Where does this ship out of? I want to get an idea of shipping time. @Adrienne the mat ships out within 1-2 business days after the order is placed. What a cute story about your kitty playing attack! I think cats are so attracted to them, because they are interested in anything that their human is. However, my cat could care less about catnip. I don't know why. I'm sure many would enjoy this though. @Kay , Yes, you are right, there are some cats out there who don't care about catnip. The catnip is just one feature of the mat so for those cats who are not attracted to catnip, they may enjoy batting the ball around, scratching and lounging on the mat. And yes, cats really are interested in anything and everything that interests us humans! LOL Meow and Namaste! Love this! adding to my wish list. Feline Yogi’s cat yoga mats are a designated spot for cats to stretch and play. They can dig their nails in and knead their little hearts out, without disrupting your flow—or your mat. Maker Paige Guthrie Hodges noticed how her cat was drawn to her yoga mat’s texture, constantly getting in the way while she was trying to exercise. She figured if cats had their own mat to play on, they might leave their humans alone. Paige cuts typical yoga mats down to a more cat-friendly size. She attaches a catnip-filled twine ball to the mat with sisal rope, increasing the incentive to curl up on that mat instead of yours. This all-in-one lounger, scratcher, and toy wipes clean and travels easily. Bring it along as a distraction at the vet or when your cat is in an unfamiliar place.